How do you make something more obvious? You put a lampshade on it, of course. Observe. In fiction, there are sometimes implausible elements or plot holes that can’t be resolved by the author of the story. How can a storyteller respond to such a thing? That’s easy! The author can simply acknowledge the thing, whatever it is, and then move on. Of course, this doesn’t fix the thing, but it reassures the audience that the storyteller is aware of it. By drawing attention to the thing—putting a lampshade on it, figuratively speaking—the author can dispense with it and get on with the story. This technique is called lampshade hanging or simply lampshading. Lampshading is a great technique for writers because, sooner or later, most of us run into plot holes, clichés, or other issues we simply can’t fix. By lampshading those things, we don’t make them go away, but we at least make them easier to swallow. This is such a notable technique that the logo of TV Tropes, a website that catalogs tricks and tropes used by storytellers, has a literal lampshade hung on it. One of my favorite examples of lampshading comes from Monk, a television show about an obsessive-compulsive private detective. Many detective stories, including Monk, constantly kill off minor characters in order to give the detectives murders to solve. It really stretches the story’s credibility after a while. After all, in real life, people aren’t ingeniously murdered left and right as they are in detective stories. In Monk, murders and mysteries abound. Everywhere the detective goes, people die. The show never explains this implausible fact, but one episode lampshades it hilariously. After yet another murder victim turns up, the show’s detective, Adrian Monk, has the following conversation with his assistant Natalie and a police officer, Captain Stottlemeyer. Natalie: Everywhere you go, every time you turn around, somebody is killing somebody else. Captain Stottlemeyer: Well, there was the time you went on vacation, and then on the airplane. Captain Stottlemeyer: Oh, and then that that stage play. Natalie: To you! Not to me, not to anybody else. It follows you around. You’re not just unlucky, it’s—it’s something else. Natalie: You’re like a magnet. Natalie: It’s like you’re causing it somehow. You’re the Prince of Darkness! Captain Stottlemeyer: No, he’s not the Prince of Darkness. I’ve seen him vacuuming the ceiling. You wouldn’t see the Prince of Darkness doing that. Natalie: No, I can picture the Prince of Darkness vacuuming the ceiling, to trick us. He’s very tricky. Monk: Stop calling me the Prince of Darkness! That’s how rumors get started. Monk’s tendency to show up wherever murders happen doesn’t make sense, and the show never explains it. By simply acknowledging it, however, the show makes this unbelievable fact a little easier to accept. Another superb use of lampshading comes from Doctor Who, the enduring British series about a time-traveling wanderer-hero. This show practically wrote the book on lampshading. I can’t find the quote, but I remember one of the show’s writers stating that the plot holes in Doctor Who are explained by the time travel in the show and the resulting butterfly effect. That’s fifty years of plot holes lampshaded by a single statement. Most impressive. If you’re writing fiction, and you’re stuck in an unavoidable plot hole or cliché, consider acknowledging it and getting on with your story. Now, if you’ll excuse me, I need to get this lampshade off my head. This entry was posted in TV & Movies, Writing and tagged Doctor Who, storytelling, writing tips by Adam Stück. Bookmark the permalink. 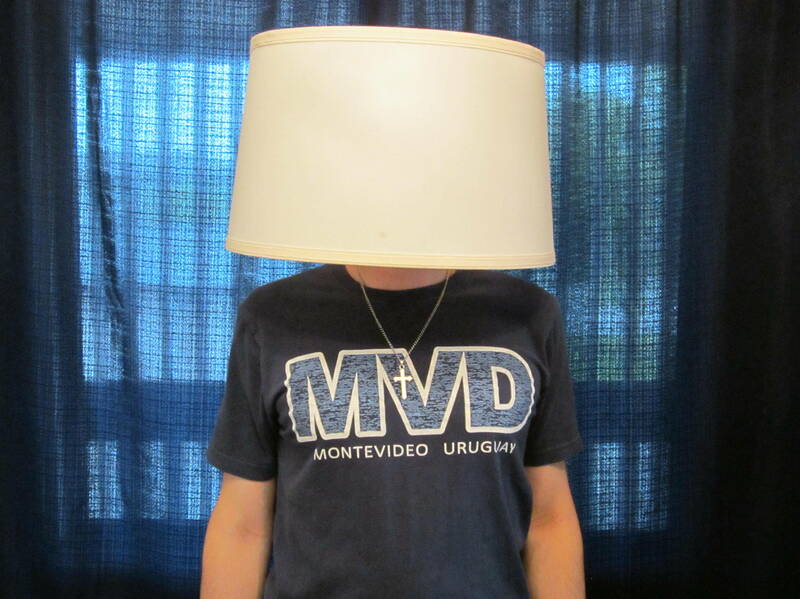 I had not heard of lampshading before, but now that I have I will use it often and with reckless abandon. Thank you, in advance. I really hope you’re joking. 😛 When problems or plot holes are fixable, they should be fixed. Lampshading is a last resort! I love everything about this post. The picture at the top, quoting from _Monk_, and the topic in general. The first time I heard about this technique was in the 200th episode of _Stargate SG-1_. Except the character said “hang a lantern on it.” The whole episode was a spoof on the show itself and on show writing. Even using (purposefully) incorrect terminology, it was a great explanation of the trope. There are actually a number of terms used for the concept of lampshading, including “hanging a clock on it,” “hanging a lantern on it,” and “spotlighting it.” (TV Tropes is my source for these phrases.) These phrases are all correct; “lampshade hanging” just happens to be the phrase most widely in currency.